August 11, 2010, was a Wednesday. I know that. I will always know that. And I will remember that everything started the Friday before, when I received a phone call from my grandmother’s “friend,” Bernie. It was simple, short, and changed my life forever. “Call the ambulance. Your grandma needs one.” Click. It wasn’t the first time I’d received a phone call like that. Bernie would frequently call me when something was up with Grandma. Usually it was nothing serious, but this time was different. I live 15 minutes from town, so I called my mom and asked if she could drive over right away and check things out. She called me back shortly after, telling me that Grandma was on the floor, alive, but not responding. The ambulance was on its way. I packed up the kids, made arrangements for their care, and left for town. My sister was on her way back to Fargo, so I called her to let her know that she needed to meet us in Oakes. When I got there, they told us the news. Grandma had had a stroke…a bad one. The damage was mainly to her right side of her body, but they didn’t think it was something she would survive. She could have a few minutes, or a few days. Had she been younger than her 89 years and 11 months, they could try some different things, but Grandma had made her wishes well known for years now. There was to be no heroic efforts to extend her life. But she was awake, and could communicate. She had impeccable taste. She never went out without looking her best. Her earrings matched her outfit, which matched her shoes, which matched her purse. She wore stylish things, not what she called, “old lady wear.” For her 80th birthday, she asked for a pair of leather pants. I obliged. Although it wasn’t easy finding leather pants and vest to fit an 80-year-old. She wore them with pride. Just about every morning I would call Grandma and talk about the day’s activities, or whatever may be. She was my sounding board, my confidant, and in many ways, my best friend. Her memory had been slipping these last few years. And I teased her that I didn’t mind one bit, because then I knew my secrets were safe. And here I was, forced to say goodbye. I wasn’t ready. Even though she was 89-years-old. I wasn’t ready. But I tried to pretend it was OK. I spent time with her, just holding her hand. Telling her that I loved her. She slipped into a coma that night. We had to make a decision not to extend extreme life saving measures. We had to prepare to let her go. On Monday evening, I went to the hospital with my older brother. To our surprise, Grandma was more alert and responsive than she had been since being brought in to the hospital. When we were getting ready to leave, I thought for sure that she was making a rally. Perhaps she was going to be OK after all. I gave her a kiss and asked if I would see her the next day…she shook her head no. And that’s when I knew. I had been given a gift. A gift of one last moment. 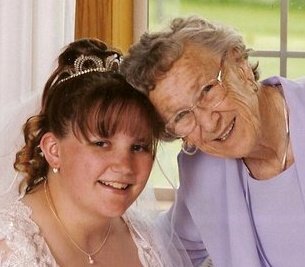 Grandma slipped back into a coma, and passed away Wednesday morning. What a tribute that has me crying. You are truly blessed to have had that relationship with your grandma and what a woman you are from it. You’re right, Katie, I am blessed. Thank you. And I’ll take that hug…anytime. I just got home from work and saw this…read it and feel like I lived this but it would have been my grandfather…as I write this the tears are flowing…the bond I had with both my grandparents are something I would never change…my grandmother sits in a “home’ and is 89 and until our last visit would only know my 8 year old daughter…now nothing 😦 thanks for reminding me GRANDPARENTS ARE THE BEST! story, thank you so much for sharing. Val, sounds like you had a very special relationship with your Grandma. This was a beautiful tribute to her. Thanks for your story Val, wish I could give you a hug. I know you must miss her so much. Lovely post. Visiting your blog for the first time, and I’m sure to return! My Grandma W looked like she could have been your Grandmas twin! Although, I’m pretty sure my Grandma never would have worn pants, leather or otherwise! Dresses, even in the garden, earrings all the time, and aprons while cooking. So proper! I wasn’t lucky enough to live close to my Grandma in No Dakota, but saw her just once a year. Letters were our mainstay………..and our love of fabric & sewing. What a woman! Thanks for taking me down memory lane this morning….. Thank you, your kind words are appreciated. Yesterday was a tough day for me, but I received a phone call from a dear cousin that made my day! And the messages here have been so supportive. Thank you all!